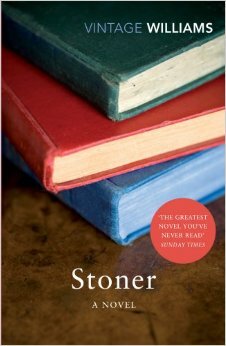 Stoner was a book that had long been on my radar before, in a moment of lapsed restraint, I hit the buy button on my Kindle. It seemed like just the kind of novel I felt like reading over the Christmas holidays whilst nestled in my parent's house enjoying some much needed respite from every day life. I really enjoy cradle to grave type novels and this was no exception. William Stoner is from a farming family and at the age of nineteen he is sent to the University of Missouri to study agriculture where he discovers a deep curiosity about the study of literature. This discovery changes the course of his entire life as he alters the focus of his studies and ultimately takes on a doctorate in literature, and then becomes a teacher at his University. This in itself, is one reason I loved the book so much. Like many who read this blog, I love books and reading and I continue to encounter stories which alter my perspective; this interest made Stoner a highly relatable character. As we see him through his meeting and marriage to Edith, the birth of their child, an enduring love affair and the peaks and troughs of his career, the novel begins to feel like so much more than a story. It is the every day failures, the disappointments, the missed opportunities and wrong turns which make this a book so true to life, and it remains extremely poignant to a modern reader. While to some, this may appear to be only the story of an ordinary man, it is nevertheless a rich and powerful novel. I really cannot recommend it highly enough.